I want to start with my first post by explaining why I decided to make this blog. I know what you must be thinking...the last thing the world needs is another person blogging about beauty. I am not an expert on beauty by any means. I am just a girl who loves makeup, hair, art, and design. I also have an affinity for all things vintage. I am a graphic/web designer and if I wasn't doing that, I would probably be working in the beauty industry, but I'm too chicken to go to beauty school. Anyway, I am constantly scouring the web for new ideas for hair and makeup and there are several really great resources, but none that combine all of my loves. As I gather my lists of websites that I visit, I will post them so that you can use them too. But I will also be adding my own hair and makeup tutorials and sharing with you the things that I love. 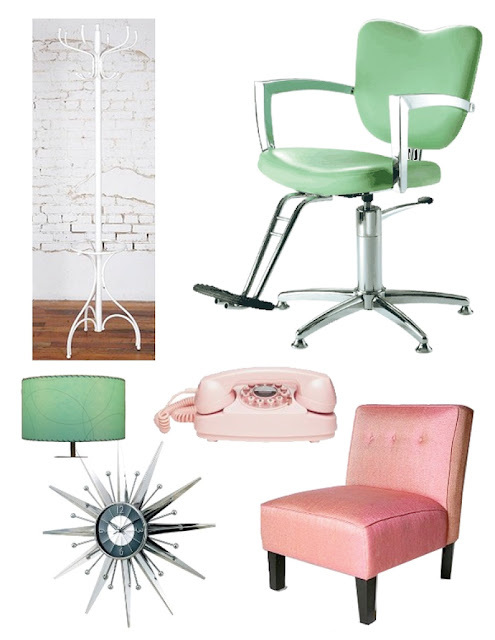 So for my first collage, I will share with you a few pieces of my "Dream Salon" that I'm building in my mind, just in case the day finally comes that I gather up the courage (and finances) to go to beauty school. I think I will name it Bouffants, after one of my favorite hair styles.